Chinese chestnut trees may sound exotic, but the species is an emerging tree crop in North America. Many gardeners growing Chinese chestnuts do so for the nutritious, low-fat nuts, but the tree itself is attractive enough to be an ornamental. Read on to learn how to grow Chinese chestnut trees. 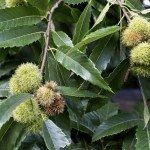 If you plant a Chinese chestnut tree, your neighbors will probably ask the inevitable question: “What are Chinese chestnuts?” A full answer includes both the tree of that name and the nut of that tree. Chinese chestnut trees (Castanea mollissima) are medium tall trees with spreading branches. 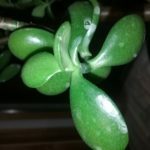 The leaves are glossy and dark green. The tree produces delicious and edible nuts called chestnuts or Chinese chestnuts. Chestnuts grow on the trees inside spikey burs, each about an inch in diameter. When the nuts are ripe, the burs fall from the trees and split open on the ground beneath. Each bur holds at least one and sometimes as many as three shiny brown nuts. American chestnuts (Castanea dentata) once grew in vast forests across the eastern half of the country, but they were virtually wiped out by a disease called chestnut blight several decades ago. Chinese chestnut trees are particularly attractive because blight-resistant varieties are available. Otherwise, the differences are slight. The leaves of American chestnuts are narrower and the nuts slightly smaller than Chinese chestnuts. American chestnut trees are more upright, while the Chinese chestnut is wider and more spreading. If you are interested in growing Chinese chestnuts, start with well-drained, loamy soil. Never attempt to a grow Chinese chestnut tree in heavy clay soil or poorly drained soils, since this will promote the Phytophthora root rot that devastates the species. Opt for soil that is slightly acidic, with a pH of 5.5 to 6.5. If you live in a cold climate, don’t plant the tree in a frost pocket since this can damage the buds in springtime and reduce the crop. Instead, pick a growing site with good air circulation. Although Chinese chestnut trees become drought tolerant as their root systems establish, you should provide ample water if you want the tree to grow well and produce nuts. If the trees are water stressed, the nuts will be smaller and fewer. Chestnuts are an excellent source of healthy starch. You score each nut with a knife, then roast it or boil it. When the nuts are cooked, remove the leathery shell and seed coat. The inner nut, with pale golden meat, is delicious. You can use chestnuts in poultry stuffing, toss them into soups, or eat them in salads. They can also be ground into a healthy and delicious flour and used to make pancakes, muffins or other breads. Read more articles about Chinese Chestnuts.